Dining Services expects to see long lines at the Culinary Chameleon food truck when it makes its debut in mid-January. 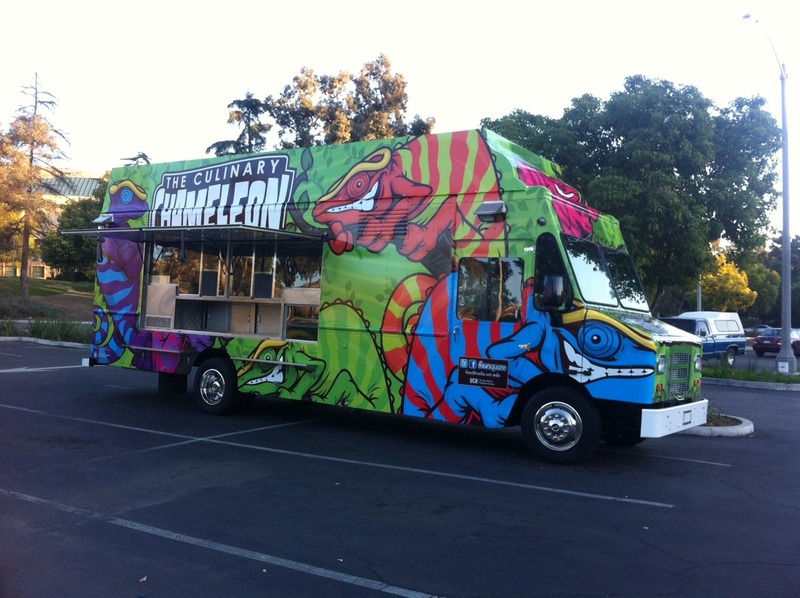 RIVERSIDE, Calif. (www.ucr.edu) – The Culinary Chameleon is coming to the University of California, Riverside, and the 32-foot food truck will provide the campus with a new gourmet dining option. It will make its debut the week of January 16, 2012. UCR Executive Director of Dining Services Cheryl Garner said that on-campus food trucks are part of a growing trend across the country. The trucks are valued for their ability to serve a variety of high-traffic areas throughout the day, compared to a regular restaurant. While some area schools have contracted with independent food trucks to cater to their campus, UC Riverside is believed to be one of the first Southern California institutions to have its own truck. The Culinary Chameleon’s debut menu will feature some familiar items from the now-defunct Taco Fresco, which closed earlier this year due to construction on the Stat-Comp Building. But the menu will evolve over time based upon customer input. The truck’s unique name and branding came from the planned menu versatility. The truck features high-performance, high-productivity commercial kitchen equipment that will permit it to conduct 95-100 transactions an hour, keeping wait times and lines short. Equipment includes a four-basket deep fryer, a four-foot griddle surface, a three-compartment sink, hand sink, three-door full-sized refrigerator, single-door freezer, a cold-prep table and a three-well steam table. Additional features include a public address system, a stereo system, two security cameras on both the inside and the outside, a pair of air conditioning units and 500 watt halogen lighting around the perimeter of the truck. The truck cost about $250,000, a fraction of the estimated $1 to $2.5 million needed to build a typical restaurant. Even with all the features and conveniences, Henry said that operating the truck will have its challenges. Like most food trucks, the Culinary Chameleon will have a Facebook page and Twitter account, allowing people to learn about specials, promotions and locations. Customers will be able to pay with credit and debit cards, Bear Bucks and cash. 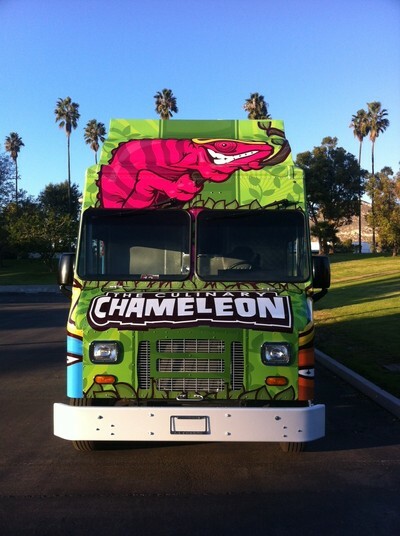 The Chameleon won’t have much in the way of competition from other food trucks, as they are prohibited by ordinances in both the city and county of Riverside except for certain special events. But as a state institution, UC Riverside follows state code guidelines and can have the truck operate anywhere on campus. Garner said another reason for purchasing the truck was that it could serve as a mobile kitchen in the event of a campus-wide emergency. A wild and distinctive look will make the Culinary Chameleon stand out as it travels across campus. The truck will also have a Facebook page and Twitter link to allow fans to keep track of hours and specials.